Apple has just released the unexpected iOS 8.1.2 update and it is now available for download. The update has been made available for all iOS 8 supported devices including iPhone, iPad and iPod touch. For those interested in updating their devices to the latest version can get this release through over the air and from iTunes. iOS 8.1.2 is a minor level update and has been released to fix bugs. 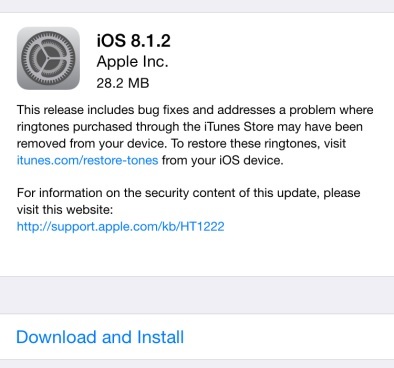 It also brings a fix for the bug that caused ringtones purchased from Apple to be removed from iOS devices. Apple has also released a web tool that users can visit to get the missing ringtones back. If you are affected by this bug then you can visit itunes.com/restore-tones to in order to restore them. It is currently unknown whether this release fixes the TaiG jailbreak, which allows users to untethered jailbreak iOS 8.1.1. If you are a jailbreak user then it is recommended that you avoid upgrading your software until further notice. You can download iOS 8.1.2 for your iPhone, iPad or iPod touch using the direct links below.